Post and rail is one of the easiest fences to build. These fences also are attractive and provide good boundary markers, although they will not confine pets and children unless they are covered with wire. They frequently are called "horse" fences because they are commonly used around horse pastures. Post-and-rail fences come in two basic styles, with round rails or with split rails and two or three rails. Installation is basically the same with either style. Installing post and rail parallel to a slope differs little from working on flat ground. Lay out the fence line with wood stakes and builder's twine, stretched from one end stake to the other. Make sure it observes any boundary lines and does not cross any buried utility lines. Place the fence line far enough back from the edge of the slope to avoid any erosion or washing problems with posts and to make the work area safe. Measure the line with a tape measure and mark spots for posts 6 feet apart (on centers of posts) or the specific length of rails being used (some come in 7- or 8-foot lengths). Place posts on the ground in the proper locations for a "dry fit." 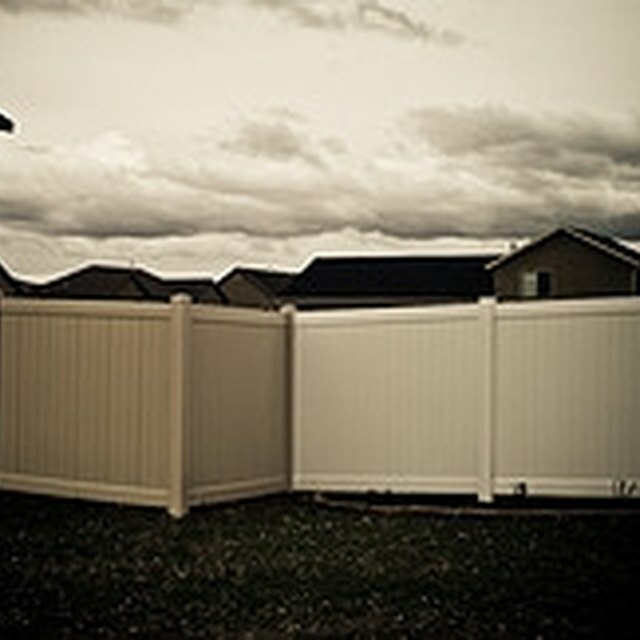 Make any adjustments if the fence length does not conform exactly to the spacing of the posts and rails. Shorten both ends equally if you have to adjust the length to fit, rather than having one very short rail on one end. Test fit the rails, which have tapered ends that fit into holes in the posts, to make sure spacing is correct. Allow for any gates that may be needed. Dig holes for posts with a post hole digger, about 10 inches wide and 4 to 6 inches deeper than will be needed. Set posts a third of the total length -- 2 feet deep on a 6-foot post for a 4-foot two-rail fence, for instance. Put 4 to 6 inches of gravel in the bottom of each hole for drainage. Anchor corner or end posts in concrete and let the concrete dry at least overnight before installing rails. Set other posts in the holes but do not secure them until rails are added. Run builder's twine with a line level between the tops of the end posts to make sure all intermediate posts are even. Start at one end, installing rails by putting the tapered ends in the end posts, which have holes drilled only partway through the post. Put the other end in a regular post, with holes on both sides, with that post in the hole but not secured. Begin securing posts by putting gravel in the bottom of the hole. Add all rails to the other end of the fence. Go back down the fence and plumb each pole with a level. Fill the holes with concrete until all posts and rails are secured. Adjust any posts as needed to make rails level. Turn corners if necessary with special end/corner posts that are drilled on two sides to accept adjoining rails. Add strength to the fence if desired by putting a 3-inch galvanized screw into each post where each rail fits.